Since our last update I learned that I have (or had, fingers crossed) a parasite! That probably explains why I have been feeling rotten on and off for the last while. So I got some meds, which made me feel even worse, but hopefully killed the parasite... This remains to be seen. Needless to say, we ended up staying a couple extra days in Antigua to get it all sorted out. But then we hit the road again, up and over the mountains, again and again... For cyclists Guatemala is like a dream that turns into a nightmare, that turns into a dream. 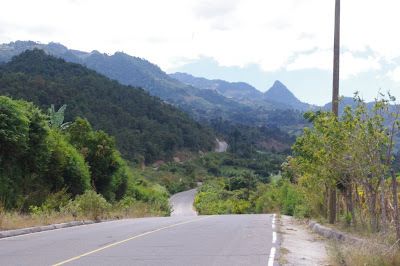 On our trip from Antigua to Copan we got to ride down some of the best and worst roads that the country has to offer... And of course we were rewarded with absolutely stunning scenery. The best reward is that our friend Carolyn is here in Copan and is going to join us for our ride through Honduras! As a former therapist, it does seem strange to be recommending catastrophizing as a life strategy; However, as a cyclist in Guatemala.... expecting the worst will reap excellent mental health rewards. You can imagine the devastation of expecting a nice downhill cruise, only to be met with a road so steep and so full of rocks, sand and the occasional garbage dump, that you are forced to alternate between walking and jiggling down the hill at no more than 8 km/hour. On the other hand, if you expect hills too steep to climb, roads too torn up to negotiate, and wind too fierce to bike against.... Well, things can only improve. So, that man who rolled down his window as i was huffing my way up a very long hill to tell me "it gets harder", and who I smiled at while cursing at in my head, was actually doing me a favour, because yes there was more to climb, but it didn't actually get too much harder. So expecting the worse has some merits....when cycling in Guatemala. The aforementioned road conditions forced us to let go of any ideals about how many kilometres we might ride in a day. Our daily average for Guatemala was probably somewhere around 50 km a day, and some days we only made it about 40 by dark. In Guatemala we (read I) let go of some of my self-imposed rules about not walking by bike up (or down) hills. As I was pushing my bike up one particularly steep stretch, I even accepted the offer of a kind stranger to help me push. In earlier times, I would have flat out refused and insisted on doing it alone. Guatemala is humbling for the cyclist. I am hoping this message hasn't been over-done in the journals yet, because it is actually something that we have grown to appreciate more and more on this trip. On our last stretch in Guatemala we were confronted with kindness again and again... And often it was this kindness that kept us going. People offering us drinks, food or just encouraging honks and thumbs up. But, one evening does stand our for me. It wasn't anything big, but it had a huge impact. It was getting dark and we were rolling into the town of Zacapa. We had had a very long day, were both tired, and I was getting pretty anxious about biking in the dark. This all translated into some major grumpiness and perhaps an utterance of some unkind words. All these feelings were reaching their peak as we were climbing (of course!) into town, but it was just then that a car honked and a very little boy stuck his head out the window and gave us the cutest thumbs up in history. Everything shifted in me, I smiled and laughed and was reminded for probably the billionth time that the world is kind and people are good. So, thank you little boy wherever you are. This one is more therapisty, and therefore a little more cheesy. But we have been reminded that what might seem insurmountable (like a giant mountain), is surmountable when you take it slowly and more importantly when you believe that you can do it. I remember people asking us before we left "aren't you worried that you won't be able to do it", and this has certainly crossed our minds. But when you break the journey into weeks, or days, or hours, or even kilometres... It becomes doable.